On Thursday, it felt as if Britain would vote to Remain in the EU and we’d all go back to normal. Prime Minister David Cameron resigned in disgrace. SNP leader Nicola Sturgeon began the process of a new Scottish Independence referendum. And now we’re talking seriously about whether Northern Ireland — which voted Remain — should be reunited with Ireland in order to stay in the EU (Ireland, of course, uses the euro not the pound sterling). The Brexit result emboldened nationalists across Europe, who are now demanding their own in/out referenda, threatening the entire existence of the EU. This is all Cameron’s fault. In an historic gamble, he promised in 2013 to hold an in/out EU referendum in order to appease the nationalist wing of the Conservative Party and, hopefully, snuff out the UKIP threat that was peeling votes from the Tories. His bet was that Britain would do the expected thing: To realise that its economic bread was buttered on the European side. In hindsight, Cameron’s bet was a colossal blunder that could lead to the end of the “United Kingdom” of England, Wales, Scotland and Northern Ireland as a whole. This nation has existed peacefully and prosperously with itself since 1707. (Except for the Irish bit, but we solved that in 1994). And it looks as if that one wrong decision from Cameron could destroy the whole thing. The Scotland move is obvious: The SNP has only become more popular since the Scottish referendum of 2015, and English Leave votes just demonstrated to even loyal British Scots that the folks down South can’t be trusted, again. It is really hard to see the Scottish “No” to independence majority re-emerging again to stay inside a UK that isn’t European. The Ireland thing, however, is just astonishing. Why should Northern Ireland be pulled out of the EU by English and Welsh votes? It’s a legitimate, real question that has never been asked before. It just never came up! Now it’s a foreseeable reality. 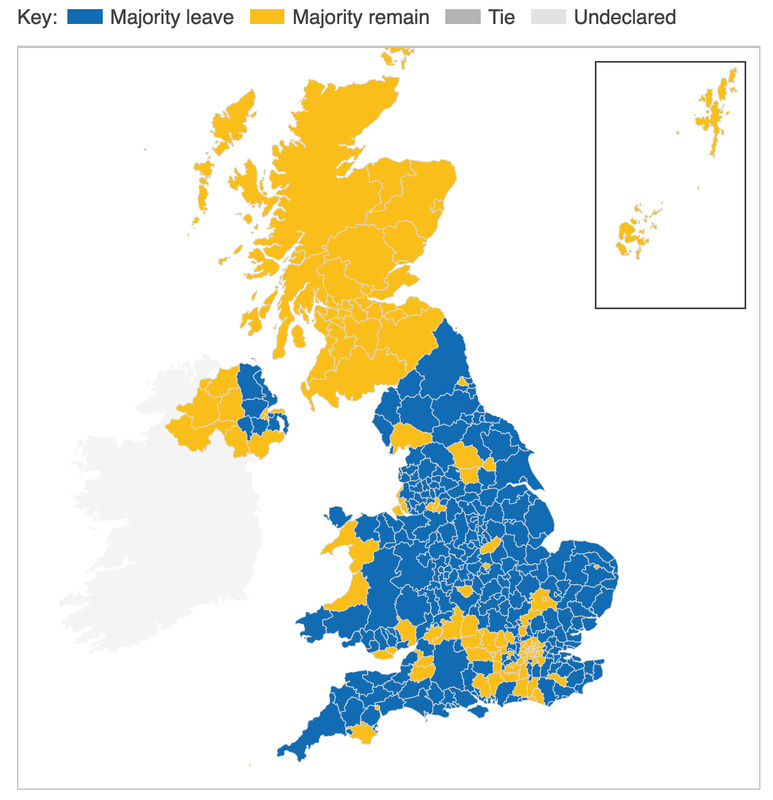 The BBC’s map, above, really shows how geographically split the country is right now. Scotland is European. England and Wales are “independent.” And Northern Ireland, separated by a sea from both Scotland and the mainland, voted to remain as European as its historic motherland. Irish reunification outside of the UK suddenly, weirdly, makes a lot of sense (although Irish Unionists will oppose it bitterly) both politically and geographically. Europe, too: The EU is a deeply flawed institution but it has one shining achievement: There has not been a World War in Europe for 66 years. People forget that the original premise of the EU was to bind the countries together so that it would be economically impossible for them to wage war on each other again, as they did twice in the last century. It worked. That’s the true tragedy here. We had a United Kingdom and peace in Europe in 2013. And then Cameron opened his mouth. It is interesting that he admitted “the ship” is not steady. Because he will forever go down in history as the captain who drove it onto the rocks.